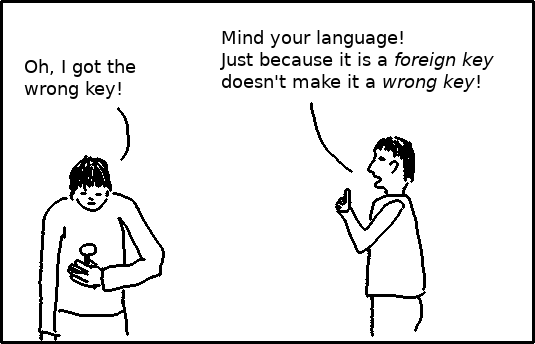 Are your foreign keys indexed? Blog » Are your foreign keys indexed? Foreign key constraints are an important tool to keep your database consistent while also documenting relationships between tables. A fact that is often ignored is that foreign keys need proper indexing to perform well. This article will explain that and show you how to search for missing indexes. In the following, I will call the table on which the foreign key constraint is defined the source table and the referenced table the target table. The referenced columns in the target table must have a primary key or unique constraint. Such constraints are implemented with unique indexes in PostgreSQL. Consequently, the target side of a foreign key is automatically indexed. This is required so that there is always a well-defined row to which the foreign key points. The index also comes handy if you want to find the row in the target table that matches a row in the source table. In contrast to the above, PostgreSQL requires no index at the source of a foreign key. 1. You perform a join between the two tables where you explicitly search for the source rows referencing one or a few target rows. If there is an index on the columns at the source, PostgreSQL can use an efficient nested loop join. This is well known and pretty obvious. 2. You delete rows or update key columns in the target table. Then PostgreSQL has to check if the foreign key constraint is still satisfied. It does so by searching if there are rows in the source table that would become orphaned by the data modification. Without an index, this requires a sequential scan of the source table. How to check for missing indexes? The result is ordered by the size of the table, so that the tables where the missing index hurts most are listed on top. Should I create indexes for all foreign keys? If the source table is small, you don’t need the index, because then a sequential scan is probably cheaper than an index scan anyway. Also, if you know that you never need the index for a join and you will never delete a row or update a key column in the target table, the index is unnecessary. There is one simple way to proceed: create all missing indexes, wait a couple of days and then get rid of the indexes that were never used.